This article takes us through two of the most recent projects carried out by Edgetech Europe with its Super Spacer® system. Firstly for glass facades eight metres high and more than 20 metres wide, concave and convex, in the reconstruction of the Gustave Eiffel Pavilion and the Ferrié Pavilion in Paris; and the ‘Museum of the Future’, currently under construction in Dubai. Digitisation has transformed architecture. 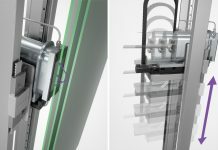 Buildings and facades are created that would not have been possible without 3D design and computer-aided algorithms. 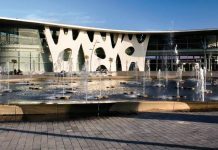 By virtue of its malleability, the flexible Super Spacer® spacer system made of structural foam can be installed in some of the most exposed, free-form glass facades of the past decade. 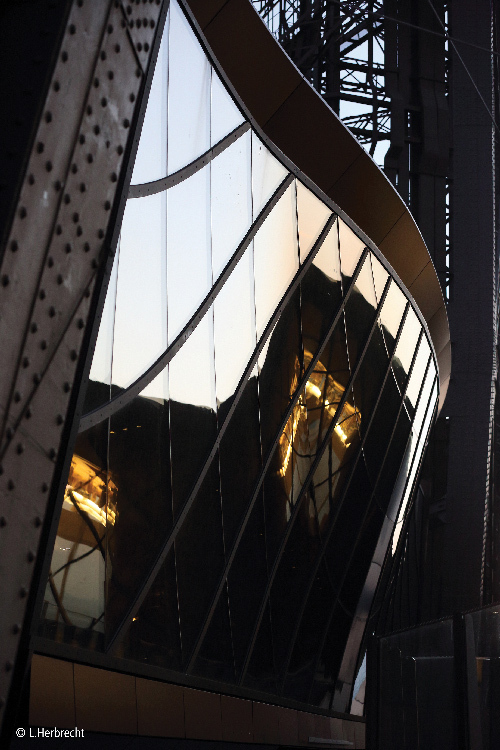 More than 20 years have passed since the CAD software CATIA was used for a prestigious building for the first time in the design of the titanium outer skin for the Guggenheim Museum in Bilbao. This software, which was originally developed for the aircraft construction sector, is now also irreplaceable in the glass architecture field. “One can justifiably claim that complex buildings such as Zaha Hadid’s ‘The Opus’ or even the ‘Museum of the Future’, which is still under construction in Dubai, could not have been realised without digital planning tools,” explains Johannes von Wenserski, authorised signatory at Edgetech Europe GmbH. The company based in Heinsberg is therefore particularly proud of the fact it is the first choice for such projects. First floor of the Eiffel Tower. Glass facades with double bends were realised with simple, cylindrically bent, rectangular glass elements. The graduate mathematician Zaha Hadid knew what type of burdens she could subject her designs too. Other architects are increasingly using the help of mathematicians to realise complex shapes. The relatively recent discipline of architectural geometry also played a role in the last renovation of the Eiffel Tower, which was completed in 2014. One of the key requirements placed upon the first of three viewing platforms to be redesigned at a height of 57.6 metres was to make it more attractive to visitors. The design provided by the Paris office Moatti-Riviére emerged as the winner of an architecture competition. The Gustave Eiffel Pavilion and the Ferrié Pavilion complete with a museum as well as an information and service area were each reconstructed between two pillars. In the case of the already existing 58 Tour Eiffel restaurant the glass facade was brought in line with those present in the other two pavilions. Glass surfaces facing inside and outside, a 130 square metre glass floor, which opens up a view of the Champ-de-Mars below and a 2.5 metre high, surrounding glass balustrade, are not recommended for people who suffer from severe vertigo, but delight all other visitors while offering the greatest possible transparency in all directions. The double-kinked glass facades of the pavilions follow the angle of inclination of the pillars of 17 degrees. 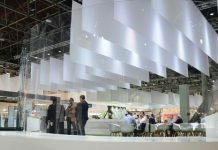 Naturally, a glass facade that is eight metres high and more than 20 metres wide, concave and convex, cannot be manufactured in one piece. For the modelling of the individual panels, the free-form surface had to be dissected into individual, non-plane surface sections according to the principle of discretisation, which naturally may not reveal any measurable deviations at the connecting lines. 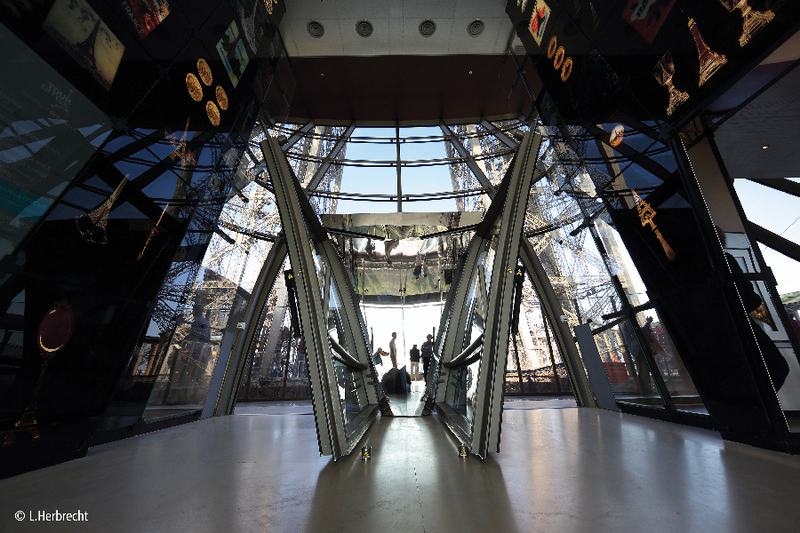 Doubly kinked glass elements were ruled out on grounds of cost, and the facade planners RFR Paris thus got the team of Evolute GmbH headed by Professor Helmut Pottmann, optimisation of the calculation algorithms was ultimately a ‘mosaic’ of simply cylindrically bent, rectangular glass elements that could be produced economically on state-of-the-art glass bending machines. Each of the insulating glass elements weighs 950 kilograms. 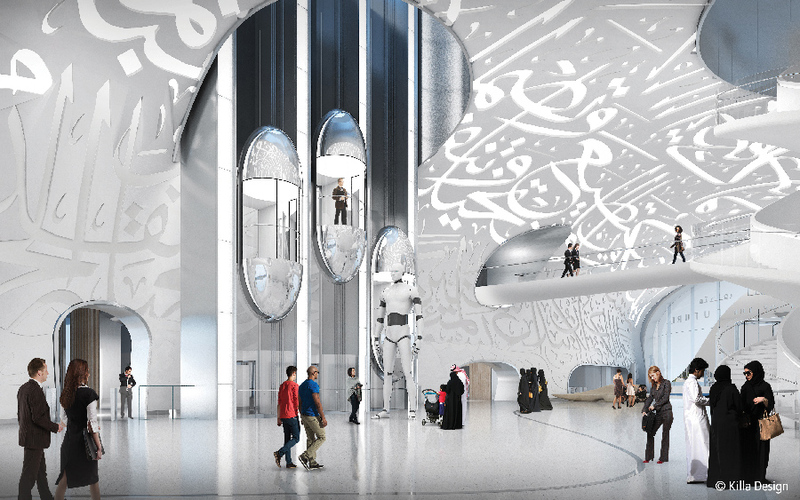 7,000 Shaped insulating glass elements form the vision area and spandrel area of the Museum of the Future in Dubai with fibre-reinforced stainless steel forming together an 18,000 square metres facade area. Many experts consider the ‘Museum of the Future’, currently under construction in Dubai, to be the most complex building in the world. After its opening in 2019, it is expected to become a home to innovation and vision, ranging from the fields of science to medicine through to architecture and design. The toroidal-shaped building with the striking opening at its centre was designed by Shaun Killa of Killa Design. BuroHappold is responsible for the engineering, BAM International for the construction and AFFAN Innovative Structures manufactures the facade made of fibre reinforced stainless steel, which is broken up by thousands of custom-made insulating glass elements and provides it with its unique calligraphic ornamental form. According to Shaun Killa, Feng Shui was the inspiration behind the design. In Feng Shui, round forms symbolise the fertility of the earth, the boundlessness of the sky, and the emptiness between them the unknown, i.e. the future. 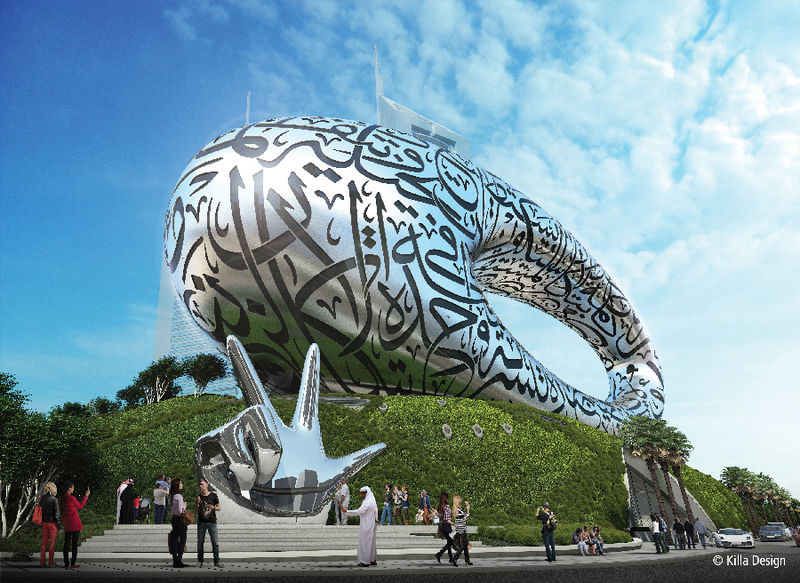 The Arabic characters reproduce quotes from the ruler of Dubai and founder of the museum, Sheikh Mohammed bin Rashid Al Maktoum. “The three-dimensional shape represents an unprecedented challenge in every sense,” explains Fernando Morante, Technical Director of AFFAN. “Even if you’ve planned curtain walls for decades, you always start from scratch when working on such a project.” Commencing in the area of fire safety, there were no valid norms and standards, therefore AFFAN developed a special, ultra-lightweight composite for the outer skin, which passed all fire safety tests with flying colours. Not only in terms of the high-tech building material, but also in terms of the elaborate 3D construction using CATIA, they borrowed a lot of ideas from the aviation sector. “In the pre-digital era you would not have been able to plan this spectacular building,” Fernando Morante confidently claims. Around 7,000 insulating glass elements, each of which is uniquely formed, are embedded in the outer skin, along with approximately 36,000 linear metres of Edgetech Super Spacer® TriSealTM Premium Plus spacer. Fernando Morante is speaking from experience: “Since we used Super Spacer for the first time ten years ago for free-form insulating glass units in the Sheikh Zayed Mosque in Abu Dhabi, we have not had any problems with the panes of glass whatsoever. Therefore, for me, Super Spacer was the GO TO product to be assigned a key role in the realisation of the ‘Museum of the Future’ right from the start. Due to the flexibility of the material, we can go to the limits of what is technologically feasible. Using rigid spacers, perfectly and individually shaped windows with very complex shape would have been virtually impossible to create,” continues Fernando Morante, “especially since the quality requirements are extremely high – unsurprisingly for a building that will set standards in every way.” When it opens in 2019, Fernando Morante is confident that the museum will be one of the most, or even the most, iconic structure fitting the legacy and dreams created by Sheikh Mohammed. Arabic characters form the windows. Edgetech Europe is a fully-owned subsidiary of Quanex Building Products Corporation, an industry-leading manufacturer of components sold to Original Equipment Manufacturers (OEMs) in the building products industry. Quanex designs and produces energy-efficient fenestration products in addition to kitchen and bath cabinet components, with its head offices in Houston, Texas. Based on turnover Edgetech/Quanex is the world‘s largest manufacturer of spacers. Edgetech Europe GmbH is a sales location for the markets in continental Europe and one of the three worldwide Edgetech production plants, with a total of 450 employees and 16 extruders.